Shares of the e-commerce specialist sold off with the broader slide in tech stocks. Here's what you need to know. Shopify Inc. (NYSE:SHOP) tumbled last month as the high-priced growth stock got swept up in the broader sell-off in tech stocks as investors sought safety in a rising interest rate environment. Even a solid earnings report at the end of the month was not enough to overcome that pressure as Shopify shares finished October down 16%, according to S&P Global Market Intelligence. The stock generally tracked the Nasdaq, which lost 9% last month. The chart below tells the tale. There was no specific news item driving Shopify stock lower in the first half of the month as the stock seemed to fall on broader investor market concerns about the Federal Reserve raising interest rates and a simmering trade war with China. Rising interest rates tend to squeeze growth stocks for a number of reasons. They can signal the end of a bull market as they're designed to prevent the economy from overheating, and they make debt more expensive, pressuring unprofitable companies like Shopify, which operates at breakeven. Therefore, rising interest rates cause investors to seek safer investments like dividend stocks and bonds, which offer a more reliable return. Toward the end of the month, Shopify turned in a strong third-quarter earnings report, which helped it recover some of its earlier losses. The cloud-based e-commerce specialist turned in another round of impressive top-line growth, with revenue increasing 58% to $270.1 million, beating estimates at $258 million. Adjusted earnings per share fell by a penny to $0.04 as the company continues to invest in growth, but that also beat estimates at $0.02. CFO Amy Shapero said, "Merchants' GMV (gross merchandise volume) expansion was well ahead of e-commerce growth overall, and our merchant base continues to expand at a healthy clip. We're well positioned to close 2018 and enter 2019 with excellent momentum." 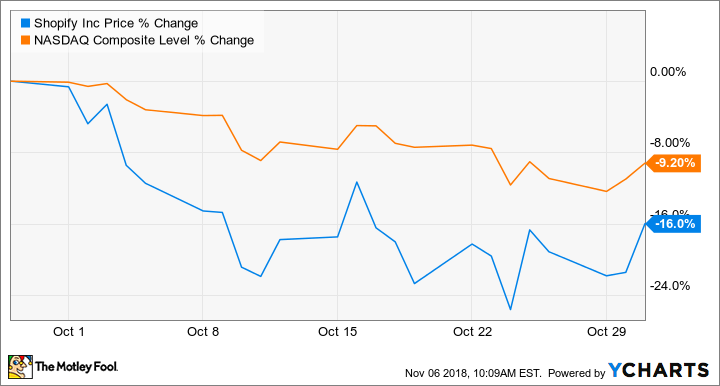 The upswing Shopify experienced toward the end of October continued into November with shares up about 3% this month at the time of this writing. Despite the October sell-off, Shopify remains on track as management raised its full-year revenue outlook from $1.015 billion-$1.025 billion to $1.045 billion-$1.055 billion. Still, investors should expect continued volatility from the tech stock especially as uncertainty in the broader market remains.